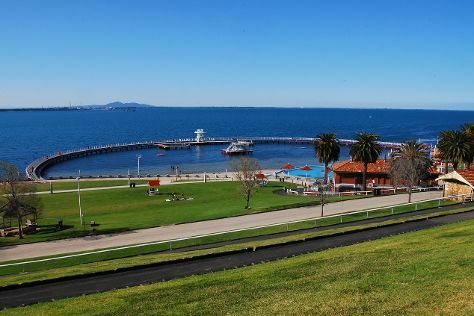 You'll get in some beach time at Eastern Beach Reserve and St. Kilda Beach. Take a break from the city and head to Melbourne Zoo and Werribee Open Range Zoo. Next up on the itinerary: take in nature's colorful creations at Royal Botanic Gardens, have some family-friendly fun at Pinball Paradise, and enjoy breathtaking views from Melbourne Star Observation Wheel. To find more things to do, traveler tips, maps, and tourist information, go to the Melbourne online visit planner . Cape Town, South Africa to Melbourne is an approximately 20.5-hour flight. Due to the time zone difference, you'll lose 8 hours traveling from Cape Town to Melbourne. Traveling from Cape Town in April, expect nights in Melbourne to be about the same, around 11°C, while days are a bit cooler, around 23°C. Cap off your sightseeing on the 18th (Thu) early enough to travel to Port Douglas. Explore hidden gems such as Trinity Beach and Coffee Works Port Douglas. Step out of the city life by going to Daintree National Park and Safaris. Spend the 19th (Fri) among aquatic life with a scuba or snorkeling tour. The adventure continues: identify plant and animal life at Hartley's Crocodile Adventures. For traveler tips, ratings, where to stay, and other tourist information, read Port Douglas travel planner. Traveling by combination of flight and shuttle from Melbourne to Port Douglas takes 6.5 hours. Alternatively, you can drive; or do a combination of bus and train. Traveling from Melbourne in April, expect nights in Port Douglas to be much warmer, around 25°C, while days are a bit warmer, around 34°C. Cap off your sightseeing on the 22nd (Mon) early enough to travel to Brisbane. Kick off your visit on the 23rd (Tue): take in the waterfront at Eagle Street Pier, then ponder the world of politics at City Hall, then identify plant and animal life at Lone Pine Koala Sanctuary, and finally explore and take pictures at Suncorp Stadium. Keep things going the next day: have fun at Downfall Creek Bushland Centre, then walk around South Bank Parklands, and then admire the natural beauty at City Botanic Gardens. 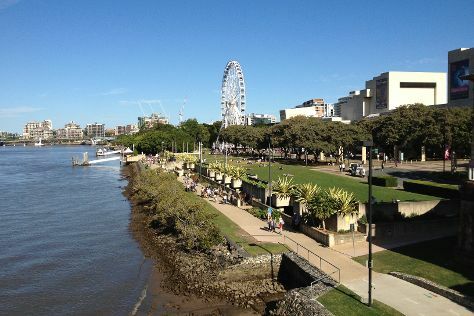 To see other places to visit, maps, where to stay, and other tourist information, use the Brisbane trip builder site . Do a combination of shuttle and flight from Port Douglas to Brisbane in 6 hours. Alternatively, you can do a combination of shuttle, flight, and bus; or drive. Expect slightly colder temperatures when traveling from Port Douglas in April; daily highs in Brisbane reach 30°C and lows reach 19°C. Finish your sightseeing early on the 24th (Wed) to allow enough time to travel to North Stradbroke Island. Kick off your visit on the 25th (Thu): stroll through Cylinder Beach, then take some stellar pictures from North Gorge Walk, and then kick back and relax at Amity Point Beach. To find photos, more things to do, ratings, and more tourist information, read our North Stradbroke Island online day trip planner . Traveling by car from Brisbane to North Stradbroke Island takes 3 hours. In April, plan for daily highs up to 30°C, and evening lows to 19°C. Finish your sightseeing early on the 25th (Thu) so you can travel to Bribie Island. Start off your visit on the 26th (Fri): enjoy the sand and surf at Sylvan Beach, tour the pleasant surroundings at Buckleys Hole Conservation Park, and then enjoy the sand and surf at Woorim Beach. Here are some ideas for day two: kick back and relax at Red Beach and then enjoy the sand and surf at Bongaree Beach. To see ratings, photos, and more tourist information, use the Bribie Island trip planning app . You can drive from North Stradbroke Island to Bribie Island in 4.5 hours. April in Bribie Island sees daily highs of 30°C and lows of 19°C at night. Wrap up your sightseeing on the 27th (Sat) to allow time to travel to Blue Mountains National Park. This is the official community page for Blue Mountains National Park. On the 28th (Sun), trek along Grand Canyon track, explore the stunning scenery at Pulpit Rock Lookout, then take some stellar pictures from Anvil Rock Lookout, and finally trek along Cathedral of Ferns Walk. To see ratings, reviews, where to stay, and more tourist information, you can read our Blue Mountains National Park driving holiday planner. Use the Route module to find suitable travel options from Bribie Island to Blue Mountains National Park. Traveling from Bribie Island in April, expect slightly colder with lows of 14°C in Blue Mountains National Park. Cap off your sightseeing on the 28th (Sun) early enough to travel to Sydney. You'll enjoy a bit of beach vacationing at Bondi Beach and Clovelly Beach. Eschew the tourist crowds and head to Blue Mountains and North Head Sanctuary. Venture out of the city with trips to Katoomba (Wentworth Falls & Bridal Veil Falls) and Shelly Beach (in Manly). And it doesn't end there: enjoy the sand and surf at Manly Beach, stroll through Camp Cove, take in nature's colorful creations at Royal Botanic Garden Sydney, and wander the streets of Darling Harbour. To find where to stay and more tourist information, read our Sydney route planner. Traveling by car from Blue Mountains National Park to Sydney takes 2.5 hours. In April in Sydney, expect temperatures between 26°C during the day and 17°C at night. Wrap up your sightseeing by early afternoon on the 3rd (Fri) to allow time for travel back home.